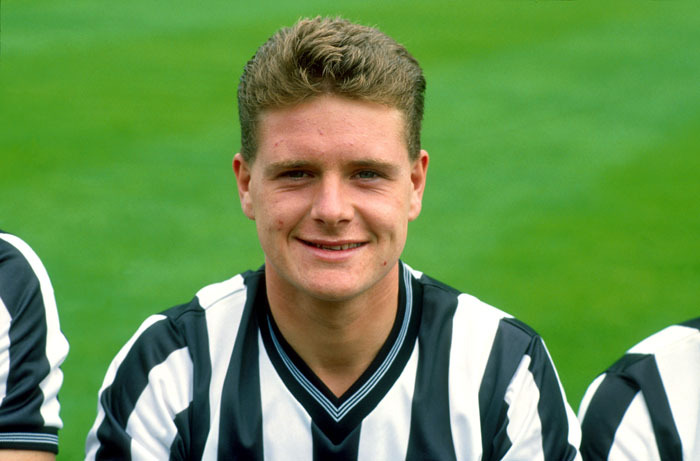 The first time I can recall seeing Paul Gascoigne don a first team Newcastle shirt was as a substitute. He came on against Spurs at St James’ Park in May 1985. He’d made his debut the month before, also at home, to QPR. He already looked 'the part'. That same season, Newcastle won the FA Youth Cup against Watford. Newcastle’s youth side included a few players who eventually made it into the first team including ‘Gazza’, Brian Tinnion, Kevin Scott and Joe Allon. After a 0-0 draw at home the youth team won the second leg handsomely, 4-1, at Vicarage Road. Gazza, in my view, was head and shoulders above everybody else on the pitch. He scored two goals, one from outside the box which begged the question, “Did my eyes deceive me?”. Newcastle’s Assistant Manager, Maurice Setters, said, “You’ll have to wait a thousand years to see that again”, in reference to Gazza’s goal. Gazza made his full competitive debut in the first match of the 85/86 season, away to Southampton. It was a balmy August afternoon. Newcastle drew 1-1 with a goal from fellow debutant, Alan Davies, whom Newcastle had signed from Manchester United (It proved to be Davies’ only goal in his three seasons at Newcastle). Once again, Gazza stood out from everyone else on the pitch. My pal Jonathan and I sang his praises as we drove up to see ZZ Top headline the Monsters of Rock Festival, at Castle Donington, later than night. One of those days you never forget. I remember at the time feeling that Gazza single-handedly kept Newcastle from being relegated in the 87-88 season. Although we finished 9th, we only played well when Gazza played. My feelings proved correct. Gazza left for Spurs in July ’88. Willie McFaul, with over £3M to spend, bought the likes of Beasant and Thorn from Wimbledon, Hendrie and Robertson – none of who had an illustrious career at Newcastle. McFaul was sacked half way through the season, to be replaced by Jim Smith. But that didn’t stop Newcastle from being relegated; finishing 20th in May 1989. The first time I saw Gazza, after leaving for Spurs, was at Watford – only this time I was sitting behind him in the crowd. 13 December 1988, Newcastle played at Vicarage Road in the Simod Cup (had to look it up!). I noticed a kerfuffle by the pie stand as I entered the ground with a bonnie lass from Glasgow on my arm. She was a Rangers supporter but somehow I managed to persuade her to come out to watch Newcastle play on a cold freezing night, in a totally obscure cup game – geet romantic like us Geordies are like. We take our seats, only to find we’re sitting immediately behind Chrissie Waddle (who’d left Newcastle for Spurs three years earlier), Gazza’s agent at the time (can’t remember his name), Paul Stewart (who later became a mackem), Gazza and several ‘hangers-on’. Gazza sat down with pie in one hand and Mars bar in the other. He munched his way through a drab 1st half. Gazza’a youth team pal, Brian Tinnion. played in midfield for Newcastle that night. He’d been to the hair stylists and donned an outlandishly short sided coiffure that made his head look like a hammer sideways on. Gazza was merciless. Every time Tinnion came near, Gazza would ball at the top of his voice “Mallet! Mallet! Mallet!” which seemed to be his deliberate transmutation of the word ‘mullet’. He wouldn’t let up. I recall seeing Waddle put his head between his knees in embarrassment. Tinnion looked up once or twice in our direction. He didn’t share Gazza’s humour and had a miserable game. “Aye, gerrus a hot dog”, came the reply and off she trotted. Five minutes later, the lass returns, “Gazza, there’s no tomato sauce, Gazza. Someone’s nicked the lady’s tomato sauce at the stand like”. “Gizzit here!” commands Gazza whilst withdrawing the tomato sauce bottle from inside his coat. By now, Waddle not only had his head between his knees, he had his hands behind the back of his head to hide his face. The second half was as drab as the first and so Gazza took to winking at the Scottish lassie by my side for about twenty minutes. Cheekie so and so. I wish Gazza well and hope sincerely that he releases the demons that have haunted him over the years. In terms of midfielders, I’ve seen play in the flesh at the peak of their career, he’s up there with Best, Beardsley, McDermott, Robson and lately Bale.